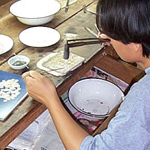 From the jewelry artisans of Thailand comes this beautiful necklace. 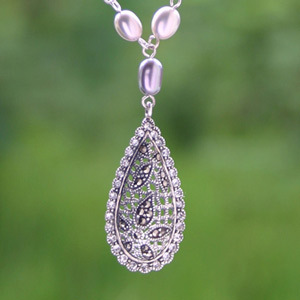 The artisans attach freshwater cultured pearls to the silver chain and encrust faceted glass and marcasite on the pendant. Flowers adorn the pendant. This necklace may vary slightly in weight and size. Natural stone - slight variations are to be expected. Materials: Sterling silver (.925), marcasite, glass and freshwater cultured pearls. This necklace is made by jewelry artisans in a workshop located in Bangkok, Thailand.